I have been writing on and on about trail running and the races I’ve joined, but what is it really like as a sport? What should a beginner expect from his or her first trail run? And how often should one train? I’m no expert, so I turned to the participants and organizers of one of the toughest and most anticipated ultra trail runs in the Philippines. 10. Trail running is a lot harder than road running. 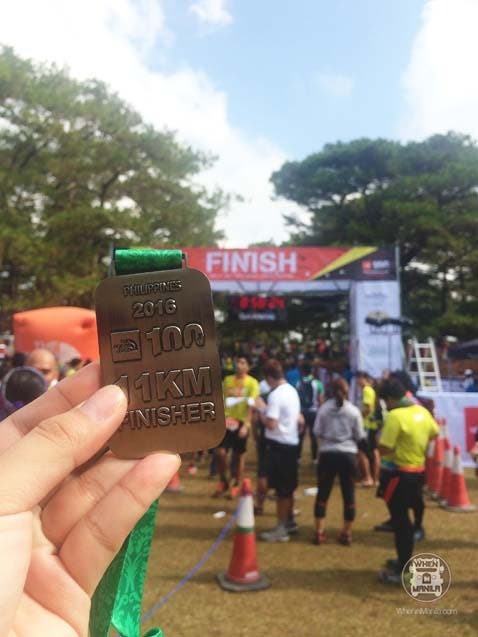 Roselle of Runningdiva.PH (who happened to be my roommate in Baguio) told me that running the trail takes twice the effort of running on the road. You aren’t just battling exhaustion and fatigue from running, you’re battling exhaustion and fatigue from crossing rivers, leaping over rocks and exposed roots, trudging up steep slopes, picking your way down slippery descents, and overcoming the elements. 9. That being said, you really need to train for it. The training depends on what you want to achieve, but for starters, it’s wise to establish a good base and run at least three times a week. Majo Liao, the 2014 and 2015 back-to-back champion of Salomon X-trail and The North Face 100, shared in a past interview that you should do maintenance runs (5-7 kilometers) on the weekdays and long distances (10-12 kilometers) over the weekend. You can adjust the frequency and distance of each run according to your goals. You should also do core and strength training exercises like planking, lunges, and squats to condition your whole body. said that he trained by running 500 kilometers in a month! Roselle added that you need to slow down your pace a bit if you’re doing long slow distance or LSD training for endurance. For example, if your race pace is 7 minutes per kilometer, stretch that to two more minutes. It’s all about finding your happy pace! Try also to squeeze in some training on the trail if you have the time. 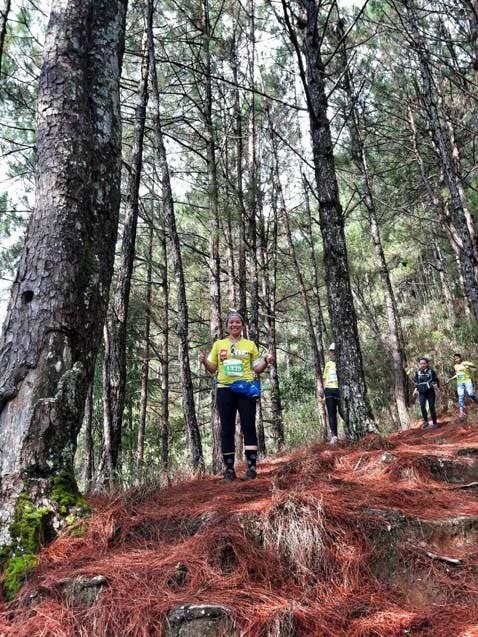 Tugaff said that on some weekends, he went to Balagbag, Rizal and Batulao to condition his body and mind for trail races. 8. You need the right gear for the trail. The unpredictable and uneven terrain calls for a special pair of shoes that will let you maneuver through the trail with comfort and ease. Admittedly, I did not have the right pair when I ran the 11K. I thought my trail shoes would do just fine, but it did not have enough padding and spring to cushion my landings – and I suffered the consequences. Halfway through the trail, pain shot through my left knee and calf muscle. After galloping a few kilometers with my other leg, I felt pain in my right knee, too. I managed to finish before the cut-off time, but I was wincing and gasping with every footfall, and couldn’t walk properly even after a day of rest. Don’t let the smile fool you – I was actually screaming internally from the pain. 7. You also need the right mindset for it. As they say, Mind over matter. You have to train your mind as well as your body because the trail will test your mental and physical limits. 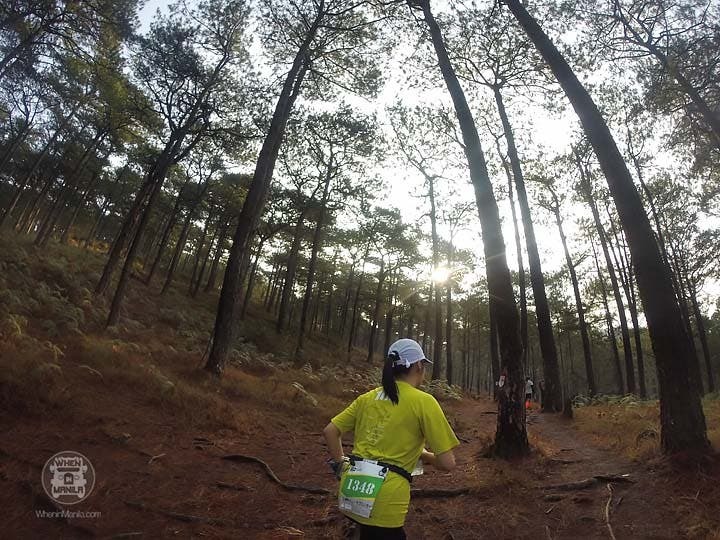 Many times throughout the Baguio trail, I came thisclose to throwing in the towel. Despite the pain in my knees, however, I kept on because I knew that if I just kept putting one foot in front of the other, I’d get to the finish line eventually. I took it one kilometer at a time and cheered silently as I got through each one without further injury. 6. Trail running is addictive. After I covered the Salomon X-trail in 2015 and ran my first 6K, I thought I’d never return to the trail (back then, I had not been particularly fond of running). But soon after that experience, I found myself saying yes to TNF100 – and a 22km trail at that! Read on to know more about the exciting sport of trail running! Calling First-time and Long-time Spinners, This is the New Gym For You!